You want blonde hair. No, you want red hair. Ah, I know, you want strawberry blonde hair! When lots of people think of blonde they automatically envision platinum hair but that’s certainly far from the only option (and the hardest to achieve). 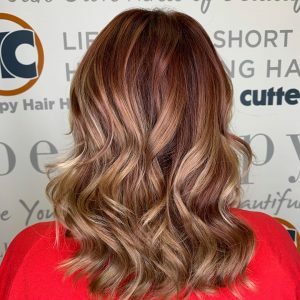 Warm honey blondes are beautiful and versatile and adding a bit of red to the mix will give you a gorgeous strawberry color—whether you’re wanting all-over color, highlights or lowlights. Virgin hair (with no previous color or lightening of any kind) is the easiest of situations. If your hair is a shade of blonde, simply depositing color on your hair may be all you need to achieve this new look. You could leave some of your existing blonde for dimension or go solid. 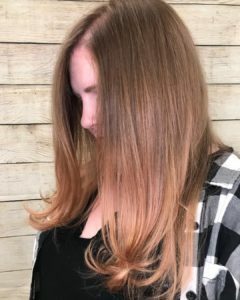 If you’re a natural redhead but want to lighten it, a heavy or subtle balayage might do the trick while leaving some of your natural red for dimension. Are you a brunette searching for a totally different look? This might involve more than one process depending on what your hair goals are. You can certainly leave some of your natural color and highlight in strawberry blonde, or you can go bold and do an all-over color. Just know, your hair may need to be lightened first and then have the new color deposited back on. It will depend on your level of natural hair color and the level of color you want to achieve. When you color your hair, it is no longer virgin, meaning changing it can become trickier or more involved. If your hair has been dyed previously but is still lighter than your desired strawberry red shade, you may only need one color application to deposit color over what you currently have. If you’ve highlighted before, this could be to your advantage because some of your hair is already lighter and may continue to lighten easier (if it’s healthy enough to handle another lightening process). After your hair is lightened, a second application will bring you to your desired shade. As explained in our Color Correction blog post, color doesn’t lighten color. 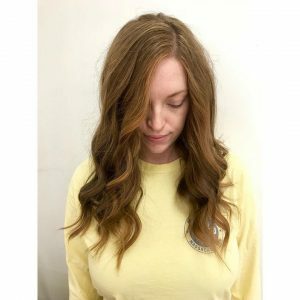 If your hair is currently darker than your desired strawberry blonde level, your hair will need to be decolorized then deposited over, a multi-step process. How many steps will depend on the previous technique done on your hair, how much it has grown out, how well your current color lightens and also what your hair can withstand. This is likely the toughest scenario but your Hair Cuttery Professional will be able to assess and explain the process specific to your hair. Just as we all have a face shape that helps determine our best haircut, we have skin undertones that help determine our best hair colors. There are warm and cool skin undertones that typically pair well with hair of the opposite tone: warm skin tones look nice with cool hair, while cool skin tones balance well with warm hues. Pairing with opposite tones helps balance out pigments instead of playing up one tone too much. If you have a cool skin tone—pinkish—and color your hair with cool colors—icy blonde, ashy brown—this could leave you washed out. If your skin undertones are warm—yellowish—cool colors can help balance your skin pigment. Here’s where it gets a little muddy…sometimes when you have warm skin undertones, redder hair colors can make your skin appear brighter. If you feel uncertain what your skin undertone is, ask your Hair Cuttery Professional to help. When thinking of strawberry blonde hair specifically, the level of redness can be adjusted to work best for you. There are cooler, blonder versions that pair nicely with warm undertones and deeper, warmer reds that couple well with cool skin tones. For pale, “cool” skin, try a strawberry blonde that leans a little more toward the orange spectrum—a nice copper hue will really make your features pop. 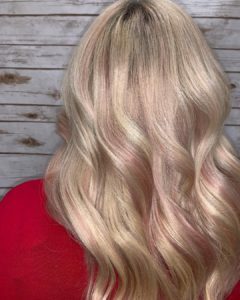 If your skin is warm, try adding an icy blonde highlight or cool brown lowlight to the mix; this will help cool down whatever level of strawberry blonde you’re shooting for. Another factor that plays into your desired shade of strawberry blonde is the season. 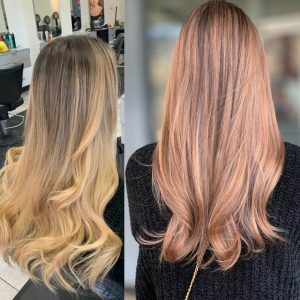 Typically for the fall and winter months, warmer, deeper hues are preferred, but as soon as the days start getting longer and warmer, many people seek lighter brighter hair. Luckily, if you love strawberry blonde, there is plenty of room to darken or lighten this color. 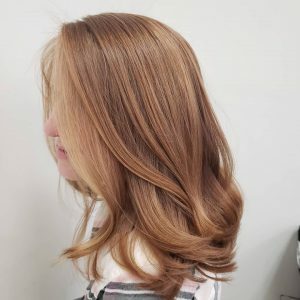 If you’ve found a strawberry blonde base color that works great for all seasons, adding lighter highlights in the spring, then darker lowlights in the fall might be just what you need to jazz things up a bit. After your color service, give your hair a few days before washing it. The less you wash, the better, especially when dealing with red hair color. Cool rinsing is OK to help manage, but leave out the shampoo. This allows the outer layer of your hair to smooth back down so it can better hold in the color molecules. After going any shade of red, learning to wash your hair less frequently will give you longer-lasting color. The deal with red hair dye is that the color molecules are larger than other pigments, so the hair has a harder time holding onto them. If you’ve gone red before, you may have noticed red-tinged water when you shampooed. Sadly, this means the color is fading. Don’t fear this! Just wash less. Ask your Hair Cuttery Professional to recommend a great dry shampoo—like our own CIBU Ka Pow Dry Shampoo—to keep your hair looking just-washed every day. As always, don’t attempt any chemical services at home. There is a lot of chemistry involved and your Hair Cuttery Professional may be applying multiple formulas to different areas of your hair depending on what they’re working with. Leave the chemicals to the professionals, sit back and enjoy the transformation, then enjoy your new strawberry blonde locks!